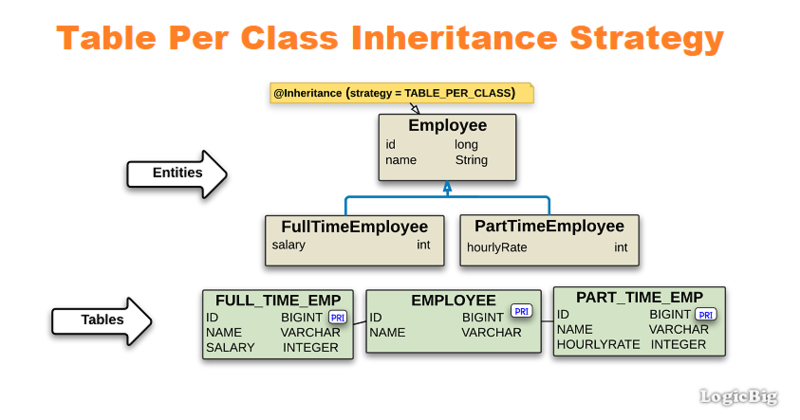 A quick overview of JPA Table per class (concrete) inheritance strategy. In this strategy, the superclass and subclasses in a hierarchy are mapped to different individual tables. All super/subclasses tables store all fields of that class plus the ones which are inherited from the super class. @DiscriminatorColumn and @DiscriminatorValue are not required to be used in this strategy. @Entity and other meta-data annotations are used on the root and subclasses as usual. @Id field should only be defined in the root class. The root class can be abstract or a concrete class. For JPA implementations, support for the table per concrete class inheritance mapping strategy is optional. That means applications that use this mapping strategy might not be portable. This strategy has the disadvantage of repeating same attributes in the tables. This strategy also uses SQL UNION queries (or a separate SQL query per subclass). When the concrete subclass is not known, the related object could be in any of the subclass tables, making joins through the relation impossible, hence providing poor support for polymorphic relationships.